I will always fondly recall my first visits as an eighteen year old to the Egyptian Museum, Cairo, in 1973. These were, to be sure, greatly exhilarating, but also a bit overwhelming at the same time, owing to the enormous numbers of artefacts on exhibit there (approximately 150,000). My initial trips to the Museum were, in addition, somewhat hampered by the absence of an overall synoptic and copiously illustrated guidebook to the vast collections, in any language, to assist the novice student studying on his own. Only considerably later did I come to find out that the last such complete work available in English, that of (Sir) G. Maspero’s, Guide to the Cairo Museum 5th edition (Cairo, 1910), which to this day still remains valuable, had gone out of print well before the beginning of the First World War! The unavailability of a current comprehensive handbook has been sorely missed. Deserving special note, in 1987, there appeared the superbly illustrated and expertly written volume by Mohamed Saleh, Hourig Sourouzian and Jürgen Liepe (photographer), Official Catalogue: The Egyptian Museum, Cairo (Philippe von Zabern: Mainz and Cairo), which on 268 pages, describes 270 of the most important objects on view in the Cairo collections, along with bibliographic information cited for each piece. It is actually in the nature of a reference work, or even a handsome coffee table book, and is rather too large to be carried in one’s hands while wandering through the many corridors and halls and, most regrettably, lacks an index for the neophyte. It is probably best purchased by people on the way out, rather than on the way into the Museum. Nevertheless, this celebrated study deserves a special place in the bookcases of all serious students of ancient Egypt. I have worn out my first copy and have had to purchase a second! These days visitors to this fabulous and unrivalled repository of ancient Egyptian treasures have, once again, at their disposal a most convenient and thorough guidebook. For the armchair traveller, this delightful new work enables a sense of penetrating the breadth and depth of the Museum’s riches, while remaining in the comfort of one’s home. This sturdily bound and handsomely printed paperback, with foreword by Dr Zahi Hawass, is 632 pages long and describes over 570 antiquities, all generously shown in full colour, yet will squeeze into a spacious front trouser pocket or easily slip into a handbag. The detailed index and thumbnail-sized pictures accompanying the ‘List of Objects’ are very user-friendly features. One minor carp, the bibliography ought to have included a far greater number of readily accessible titles in English, given the general audience to which the volume is aimed. This type of slip routinely pops-up in books which have been translated from one language into another. The handbook suggests an extremely sensible itinerary through the Museum for visitors, with excellent floor plans, and subdivides the tour into chapters devoted to the principal ages of Egyptian history, from the predynastic down to Graeco-Roman times. The dazzling highlights of the holdings, such as the splendours of Tutankhamun’s tomb and the discoveries made at Tanis are, as one might readily imagine, well represented, but there are also many rarely depicted and discussed treats as well. And for those who have little time for a full survey of the Museum, there is even a section for visitors in a hurry. In sum, The Illustrated Guide to the Egyptian Museum in Cairo is a top-notch effort, which will serve the needs of museum-goers quite admirably. Its sensible price is the topper to an all around good deal. Editors: Alessandro Bongioanni and Maria Sole Croce. Photographs by Araldo de Luca. 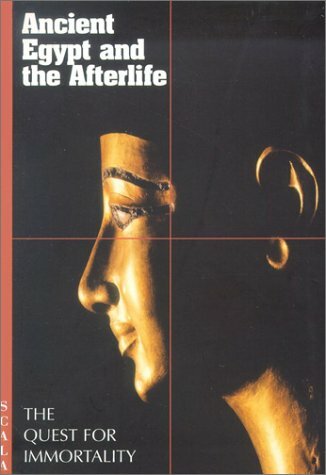 What is the truth, with regard to the way the ancient Egyptians represented themselves in texts and images? This is one of the underlying themes of Pharaoh’s People by T.G.H. James, a book that has retained much of its freshness in the two decades since first publication. ‘The desire to record great and glorious deeds is an understandable human weakness and the ancient Egyptians were no more reticent than others in proclaiming their victories while disguising, or ignoring, their failures,’ writes James in the introduction. During the years since the first appearance of this book, the term ‘spin’ has been introduced for the modern version of this human attribute, simply its latest description. 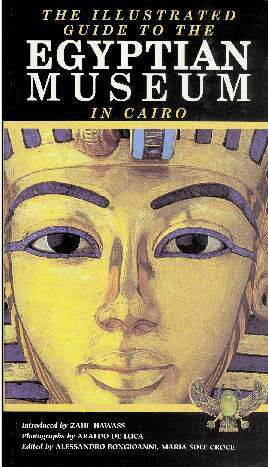 The victories and failures described in this book are not the prerogative of the king or his immediate family but of ‘ordinary Egyptians’; although the majority are perhaps extraordinary in that they were literate and sufficiently wealthy to create – or rather, have created for them - visual and textual records. The content of each chapter is clearly described in each chapter title, examples being ‘Justice for Everybody’, ‘The Bucolic Mode’, ‘Literacy and Status’ and ‘Craftsmen in Metal and Wood’, each examining sections of Egyptian society, with occasional comparisons with later groups. The mysteries of the Egyptian system for exchanging goods is dealt with practically – it worked, however strange it appears to the modern mind – and indeed it still works for some societies and for some groups within western society who have their own separate value system. 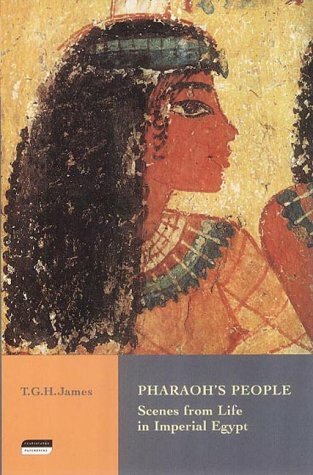 New and more detailed commentaries on aspects such as the literate community at Deir-el-Medina have superseded Pharaoh’s People, but it would still provide an excellent starting point for anyone wishing to understand, in particular, literacy and how this affected and reflected status. Further, interesting ‘asides’ such as a reference to Tutankhamun’s scribal palette, with its early form of his name ‘Tutankhaten’ and a reference to the king as ‘beloved of Thoth, lord of god’s words’, provides food for thought. In this vein could be included the reference to an early form of ‘whiteboard’ for scribal apprentices. However, one is left with a feeling for the ‘voiceless’ people within ancient Egyptian society, the non-literate and poor. These we see only through the eyes – and words - of their overseers, as in the case of one scribe whose document James describes as ‘chilling’: ‘In the end it was the peasant, the field-worker, who bore the brunt of ill-directed enthusiasm or plain malicious zeal [of foreman or scribal overseer].’ A criticism might be the quality of images in this paperback, but the line drawings are good and images are not absolutely critical to the theme, which is securely founded in documentation and the sometimes miraculous ways that any of it has survived at all, to be read and puzzled over by scholars and amateurs alike so many thousands of years later. Here is a volume that hasn’t received the full attention it is due. 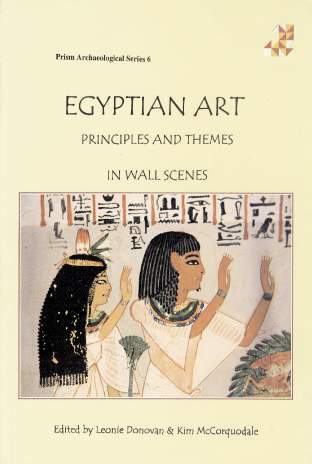 As the blurb on the rear cover explains, the ‘book is not about the aesthetic side of art, but how we should look at Egyptian art to understand it.’ This abundantly illustrated work, with over a hundred in colour, is composed of twenty chapters, with the aim of providing educated general readers and students with a readily comprehensible and sound introduction to some of the more common themes of ‘everyday life’ encountered in the decorative programme of élite private tomb-chapels, and to the rules and rationale which govern such varied wall scenes. One of the chapters is devoted to an aspect of the religious iconography of a New Kingdom royal sepulchre. This is the only contribution to have brief accompanying notes because it was previously published as a scholarly article in The Bulletin of The Australian Centre for Egyptology. The publication is the product of a collaboration between a group of researchers at Macquarie University in Sydney, Australia, where the study of ancient Egyptian art receives special emphasis, under the direction of Professor. Naguib Kanawati. The book makes for a most handy survey. It goes a long way in filling the gap in the literature perceived by the editors. However, having commended this engaging and attractive publication, I would be remiss if I didn’t address two items which could have facilitated its use and value. Firstly, it ought to have had an index. Secondly, in the absence of citing references in the text, each respective chapter should have had a separate bibliography for further study or, better yet, an annotated one. For example, the chapter entitled ‘The Tomb Owner Fishing and Fowling’ should have certainly made mention of Erika Feucht’s important paper ‘Fishing and Fowling with the Spear and the Throw-stick Reconsidered,’ in Intellectual Heritage of Egypt: Studies Presented to László Kákosy by Friends and Colleagues on the Occasion of His 60th Birthday (Budapest, 1992) Studia Aegyptiaca XIV, pp. 157-169, but alas. The bibliography at the rear of the volume is also rather basic in my judgement, given the wide-scope of the subjects dealt with between the two covers. To be fair, these minor criticisms may be the result of restrictions of the book’s publisher. The work consists of three parts. In the first section, ‘Principles of Egyptian Art’ are discussed with contributions on the Old and Middle Kingdom by Kim McCorquodale and on the New Kingdom by Juliette Bentley. Materials and techniques are covered by David Bussman and the relation of art to the physical world by Susanne Binder, who also contributes later in the volume. June Anderson addresses ‘Spatial Distribution’ and Leonie Donovan the interesting ‘Canon of proportions’ along with guidelines and the grid system. The second part looks at wide-ranging themes within private tombs with contributions by the aforementioned scholars plus Rodna Siebels, Linda Evans, Barbara Scanlan, Akkadia Ford, Lesley Kinney, Anna Cordin, Sheila Brown, Julie Ivery and Geoff McKergow. Finally, in part 3, Susanne Binder addresses ‘The Hereafter: Ancient Egyptian Beliefs with Special Reference to the Amduat’. Publisher: Foreign Cultural Information Department. This (genuinely) pocket-sized book was a bit of a mystery at first, since it did not seem to contain much in the way of new material, although it was appealingly illustrated and presented. It is worth making a comment on so-called pocket-sized volumes, since most of these do not live up to their description unless one has flexible pockets, one sports a useful craftsman’s apron as part of everyday attire or is a kangaroo. The illustrations come principally from the Luxor and Cairo Museums and the resolutions of the images are excellent as is the individual page design and layout in this book. A curiously lateral approach has been taken to production, since the majority of the pages fold out either horizontally or vertically. Some care is needed while unfolding them for the first time since it would be easy to manipulate them the wrong way. The captions are brief and pithy and some of the artefacts used are relatively unusual ones belonging to lesser-known ancient Egyptians. There is, for instance, a useful foldout page of a coffin illustrating a number of points relating to the afterlife. The whole would appeal, it seems to the reviewer, to an older child wanting an introduction to the subject although it is does not seem to be specifically targeted at this market. After unfolding and examining the contents, and folding everything back the right way (one useful thing that the study of Geography provides is the ability to fold and unfold items correctly), the little volume revealed its true strength and secret. Its appeal is the ability to pack information normally needing a large page format into the bookish equivalent of a knapsack.